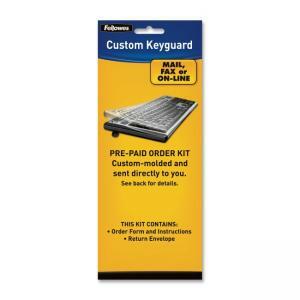 Protect your keyboard from dust and spills 24 hours a day with the Custom Keyguard Kit. Clear polyurethane cover resists abrasions, cracking and tearing while it saves your keyboard from spills, dust and grime. Cover is designed to fit precisely to your keyboard so you won't have to take the protective cover off to type. Kit includes order form, instructions, complete keyboard-model listing and postage-paid envelope to receive keyguard custom-made for your keyboard by mail within two to three weeks.